The tragedy is that we do not have this data decades ago. These drugs were all known but first ignored by bad mouthing the source and then banned because it was a mind drug. Did it ever occur to anyone that mental issues might respond successfully to drugs that impact the brain? Only now do we have a proof of concept that is highly suggestive. Hopefully we can redress this rubbish science within the next ten years and perhaps even solve some serious problems. Empirical reports suggest that ayahausca is highly effective for a range of problems including depression. 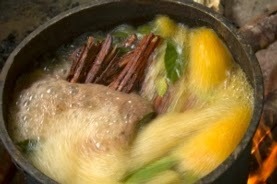 Ayahuasca, a sacramental drink traditionally brewed from the bark of a jungle vine (Banisteriopsis caapi) and the leaves of a shrub (Psychotria viridis), contains ingredients that are illegal in most countries. A psychedelic drink used for centuries in healing ceremonies is now attracting the attention of biomedical scientists as a possible treatment for depression. Researchers from Brazil last month published results from the first clinical test of a potential therapeutic benefit for ayahuasca, a South American plant-based brew. Although the study included just six volunteers and no placebo group, the scientists say that the drink began to reduce depression in patients within hours, and the effect was still present after three weeks. They are now conducting larger studies that they hope will shore up their findings. The work forms part of a renaissance in studying the potential therapeutic benefits of psychedelic or recreational drugs—research that was largely banned or restricted worldwide half a century ago. Ketamine, which is used medically as an anaesthetic, has shown promise as a fast-acting antidepressant; psilocybin, a hallucinogen found in ‘magic mushrooms’, can help to alleviate anxiety in patients with advanced-stage cancer; MDMA (ecstasy) can alleviate post-traumatic stress disorder; and patients who experience debilitating cluster headaches have reported that LSD eases their symptoms. The brew has been studied by anthropologists, social scientists and theologians, but clinical research on ayahuasca has been limited to observation of its effects in mice and rats, and in healthy human volunteers, including brain-imaging studies and retrospective surveys of past use. After their drink, the participants sat in a quiet, dimly lit room. Physicians used standard clinical questionnaires to track their depression symptoms. Improvements were seen in two or three hours (though the psychedelic effects of an oral dose take around five hours to wear off)—a rapid effect, as conventional antidepressants can take weeks to work. The benefits, which were statistically significant, continued to hold up in assessments over the next three weeks. Three of the participants vomited, a common side effect of ayahuasca, but otherwise the procedure was well tolerated, Hallak says. “It is a proof of concept of what so many ritual ayahuasca users already know: ayahuasca can help one feel extra well, not just during the experience, but for up to days or weeks after,” says Brian Anderson, a psychiatrist at the University of California, San Francisco, who was not involved in the study but has published papers on the drink’s potential. “The relationship between ayahuasca’s psychedelic effects and its therapeutic effects needs to be empirically studied,” he says. It is biochemically plausible that ayahuasca could treat depression—its plants contain compounds that alter the concentrations of the mood-regulating neurotransmitter serotonin in the brain—as do commercial antidepressants. These compounds include the hallucinogen N,N-dimethyltryptamine, which binds to serotonin receptors, and also the chemicals harmine, tetrahydroharmine and harmaline, which are thought to inhibit an enzyme called monoamine oxidase A and so prevent the breakdown of serotonin and other neurotransmitters. This article is reproduced with permission and was first published on April 6, 2015.